TORONTO, Aug. 1, 2017 /PRNewswire/ -- CNA Canada today unveiled the company's newly transformed website (www.cnacanada.ca), which delivers a guided, educational and simplified user experience. 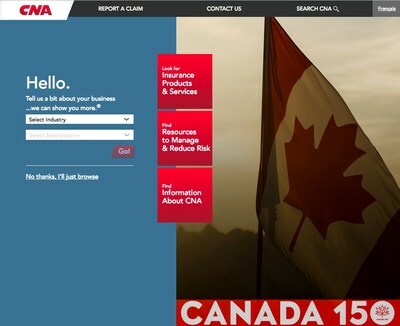 "Our brokers and customers asked for a better online experience, and we listened," said Nick Creatura, President and Chief Executive Officer of CNA Canada. "The new website offers content that will help brokers easily understand how CNA can meet the insurance needs of their customers within our segment strategies." Visitors who select one of CNA's insured segments will receive a customized view of products, coverages and information to effectively manage and mitigate risk. The new site features the insights of CNA industry experts, who provide blogs, whitepapers and other resources that can strengthen risk control programs or mitigate costly exposures. The new site also leverages marketing, communications and analytics technologies, which will guide tailored insurance products to agents, brokers, customers and other site visitors, as well as support CNA's digital and distribution strategy. Serving businesses and professionals since 1897, CNA is the eighth largest commercial insurance writer and the 14th largest property and casualty company in the U.S. CNA's insurance products include commercial lines, specialty lines, surety, marine and other property and casualty coverages. CNA's services include risk management, information services, underwriting, risk control and claims administration. For more information, please visit CNA at www.cna.com. "CNA" is a registered trademark of CNA Financial Corporation. Certain CNA Financial Corporation subsidiaries use the "CNA" trademark in connection with insurance underwriting and claims activities.